Equinix is projecting that interconnection bandwidth will grow to 8,200+ Terabits per second (Tbps) of capacity by 2021, or the equivalent of 33 Zettabytes (ZB) of data exchange per year. Equinix's newly issued Global Interconnection Index (GXI) forecasts a significant five-year compound annual growth rate (CAGR) of 48%, almost double the expected 26% CAGR of global IP Traffic as cited in Cisco's VNI report. The forecast also represents a dramatic increase over the previous year's projection. Interconnection bandwidth is defined in this study as direct and private traffic exchange between key business partners. The United States is expected to see compound growth of 45% per annum, contributing more than 40% of Interconnection Bandwidth globally. A growing number of regulations requiring data compliance is serving as a catalyst of growth for Europe, which is predicted to grow 48% per annum, contributing to 23% of Interconnection Bandwidth globally. Asia-Pacific is anticipated to grow 51% per annum, contributing more than 27% of Interconnection Bandwidth globally. Telecommunications will remain the largest industry user of interconnection bandwidth in 2021, representing 24% of the market. Enterprises interconnecting to network providers will represent the largest volume (66%) of total interconnection bandwidth. Emerging market dynamics and growing digital business adoption positions Latin America for expected 59% per annum growth, contributing more than 9% of Interconnection Bandwidth globally. Enterprises interconnecting to cloud & IT services will represent the fastest growth (98%) in interconnection bandwidth. The industries with the fastest Compound Annual Growth Rate (CAGR) of interconnection Bandwidth Consumption include: Energy & Utility (73% CAGR), Healthcare & Life Sciences (70% CAGR) and Wholesale & Retail Trade (67% CAGR). Gyrfalcon Technology Inc. (GTI), a start-up based in Milpitas, California emerged from stealth to unveil its low-power AI processing chip for edge equipment. GTI said it has taken an "edge-first" approach to its IoT technology. Its "Lightspeeur" 2801S is a 7mm x 7mm 28nm ASIC that uses just 300mW of power to deliver 9.3 TOPS/W for processing audio and video input. Between two and 32 chips can be combined on one board for heavy compute loads or separate task handling. The company said it is now shipping the device to 10 customers, including LG, Fujitsu, and Samsung. Also shipping to customers developing edge AI solutions is GTI's USB3.0 dongle with an embedded Lightspeeur 2801S that accelerates customer development processes when creating next-generation AI enabled equipment and devices. "Balancing the cost-performance-energy equation has been a challenge for developers looking to bring AI-enabled equipment to market at scale," said Dr. Lin Yang, chief scientist, GTI. "The GTI founding team has been watching the industry struggle with this challenge for decades, and believe that our AI Processing in Memory and Matrix Processing Engine provide an elegant solution to avoid having to make trade-offs. By deploying APiM and MPE on a standard, commoditized ASIC, GTI is enabling our customers to bring innovative, AI-enabled devices to the masses." "We are paving the way for the next wave of AI products to make it to market," said Kimble Dong, CEO of GTI. "We recognized that device makers were compromising on essential design variables in AI-enabled equipment and have sought to solve this over the past few decades. Our offering marries our "edge-first" approach with ultra-fast AI data processing technology, low power consumption and a small chip design to enable the best AI experience and performance at a low cost, within any AI use case, physical fit and deployment." Ampere, a start-up based in Santa Clara, California, released its first generation Armv8-A 64-bit processors for data centers. 16 cores @ up to 3.3 Ghz Turbo $550. Ampere said it has been selected by Lenovo as well as several ODMs. Ampere, a start-up based in Santa Clara, California, emerged from stealth and revealed its plans for 64-bit ARM-based server processors aimed at hyperscale cloud applications and next-generation data centers. Ampere Computing is headed by Renee James, the former president of Intel until 2016. Its team also includes three other Intel veterans: Atiq Bajwa, Chief Architect, and foremerly VP and GM of product architecture at Intel; Rohit Avinash Vidwans, Executive Vice President of Engineering, with 25 years experience at Intel including work on Xeon microprocessors for data center and enterprise servers; and Greg Favor, Senior Fellow, and 25 years experience at Intel including over 60 patents. Ampere is backed by The Carlyle Group. Ampere said its processors will offer a high performance, custom core Armv8-A 64-bit server operating at up to 3.3 GHz, 1TB of memory at a power envelope of 125 watts. It will also offer mixed signal I/O features including PCIE Gen 3, SATA Gen 3, USB and workload accelerators, as well as the high-performance on-chip fabric. The processors are sampling now and will be in production in the second half of the year. In October, The Carlyle Group acquired the compute business of AppliedMicro from MACOM, which earlier in 2017 acquired Applied Micro Circuits Corporation (AppliedMicro") in a deal was valued at approximately $770 million on the day it was announced. In March 2017, AppliedMicro announced the sampling of its third generation 16-nanometer FinFET Server-on-a-Chip (SoC) solution, X-Gene 3. The device is an ARMv8-A compatible processor that matches comparable x86 processors in CPU throughput, per-thread performance, and power efficiency while offering advantages in memory bandwidth and total cost of ownership. It features 32 ARMv8-A 64-bit cores operating at speeds up to 3.0 GHz, eight DDR4-2667 memory channels with ECC and RAS supporting up to 16 DIMMs and addressing up to 1TB of memory and 42 PCIe Gen 3 lanes with eight controllers. 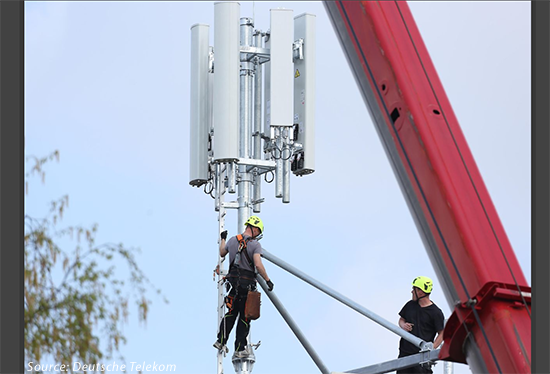 Deutsche Telekom has committed to the deployment of 1,000 new base stations and to upgrade 1,200 existing sites in Bavaria by 2020. The upgrades include deployment of the latest Single RAN technology and LTE 900. In addition to the 1,000 planned new base stations, Deutsche Telekom also plans to fill another 100 coverage gaps, often also referred to as "white spots." Deutsche Telekom is spending more than EUR 5 billion per year in Germany. Over the past eight months, the company has commissioned 30 new mobile base stations in Bavaria. It has also upgraded 220 sites with new services. Deutsche Telekom is consulting with the Czech Republic, Austria, and Switzerland, to improve coverage in border-adjacent areas. 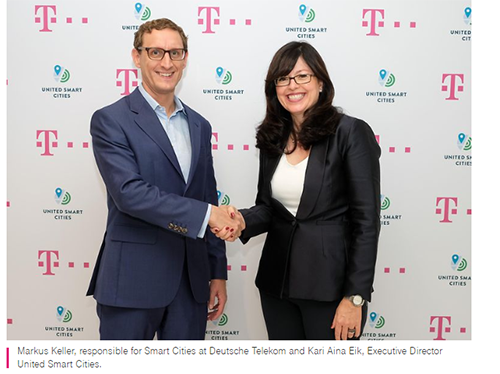 Deutsche Telekom has formed a partnership with United Smart Cities, which is a global initiative established and coordinated by the United Nations Economic Commission for Europe (UNECE) in cooperation with the Organization for International Economic Relations (OiER). The goal is to address key issues cities face today by providing tangible projects and solutions in cooperation with cities across the globe. Initial area of focus include smart street lighting, air quality monitoring or smart parking. "Cities are the hubs of the future and need individual integrated solutions to solve their challenges. Our partnership with Deutsche Telekom enables the development and showcasing of these solutions," states Kari Aina Eik, Executive Director, United Smart Cities. The worldwide service provider edge router and carrier Ethernet switch market declined eight percent in the first half of 2018 compared to 2017, according to a new report from Dell'Oro Group. Multiple factors drove market decline, but potential rebound from new products is on the horizon. The top four vendors, in rank order were Cisco, Huawei, Nokia, and Juniper. Growth in the Europe partially offset softness in North America and Asia Pacific regions. “The confluence of tepid telecom spending, maturing 4G mobile backhaul deployments, and new product introductions have contributed to the reduction in demand for routers and switches,” said Shin Umeda, Vice President at Dell’Oro Group. “Telecom operators in the US have pared down their spending well below historical levels as they evaluate new technologies and architectures for 5G backhaul, and on top of that, the massive network buildouts in China are slowing after years of growth. On the positive side, Cisco, Juniper, and Nokia have introduced major upgrades to their edge router portfolios that should bring customers back in the coming quarters,” added Umeda. The Citizen Broadband Radio Service (CBRS) market will grow at a rapid pace between 2018 and 2022 with total RAN investments approaching $1 billion and CBRS RAN shipments to eclipse half a million units, according to a new report from Dell'Oro Group. CBRS investments are not expected to have a significant impact on the WLAN capex. CBRS is projected to account for a double-digit share of the DAS market. More than 20 vendors are planning to launch commercial CBRS RAN solutions. “While there is some concern that the mid-band spectrum policies in the U.S. could impact the magnitude and pace of the 5G NR outdoor deployments and as a result enable other countries to take the lead in the 4G to 5G transition, the irony is that the U.S. is currently one of the few countries that is seeking to change the ownership model and the status quo about how networks are built,” said Stefan Pongratz, senior director with Dell’Oro Group. “And more importantly, our conversations with both suppliers and end users suggest that the new ownership model and reduced barriers-to-entry in the CBRS band is already fostering innovation and opening up new opportunities and use cases for a wide range of participants,” continued Pongratz.